The Pokeballs have been put away as Steve, Erika, Cassie, Orie, Shane, Justin and Julian discuss the most dramatic Pokemon game they have ever played. The Terrible Warriors discuss the game, their love for Pokemon and so much more! "Greetings! I'm the REAL Professor Oak! I wonder how our trainers are doing! I should give them a call!" 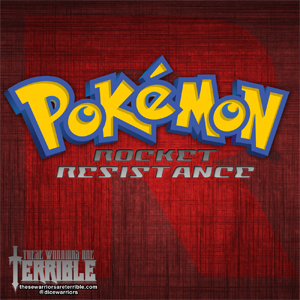 In the thrilling conclusion of our Terrible Warriors as Pokemon Trainers, they must escape Giovanni's facility and end the evil experimentation of Team Rocket once and for all! Gotta Catch 'em all! "Greetings! I'm the REAL Professor Oak! Have you been updating your Pokedex?" Our Terrible Warriors have rescued Brock from the iron grip of Team Rocket under the evil leadership of Giovanni. Before they escape the Gym, they encounter someone they did not expect. Gotta Catch 'em all!